What do you get when you mix the hit TV Show with a unique game of Slingo? Deal or No Deal Slingo of course! 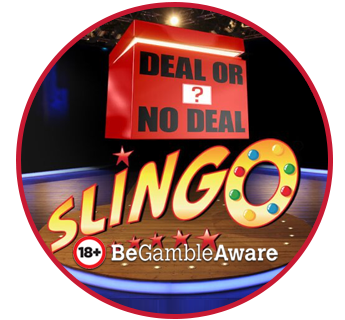 Developed by Gaming Realms, Deal or No Deal Slingo is a creation which takes its inspiration from classic slingo mixed with the popular Deal or No Deal Quiz Show. Play on any of the listed Deal or No Deal Slingo Sites to see if you can Beat that Banker today and snap up the red-hot jackpot prize of £100,000! 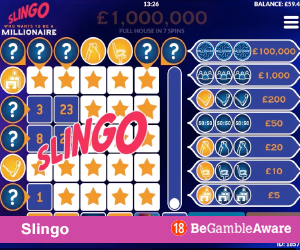 Deal or No Deal Slingo features the familiar Red Boxes and gives players the chance of Beating the Banker, for the chance to win a top jackpot prize worth £100,000! As in any other Slingo game which you play online or even in a Club or Casino, the game will present you with a 5x5 grid, but in this version of the game, it's filled with familiar numbered red boxes, which you'll recognise from the TV show. Each numbered box contains a cash prize, and when you open each it will show a value, which is listed in Blue or Red on either side of your grid, your aim is to choose and eliminate the boxes with the prizes and work your way towards a Cash offer from the banker. 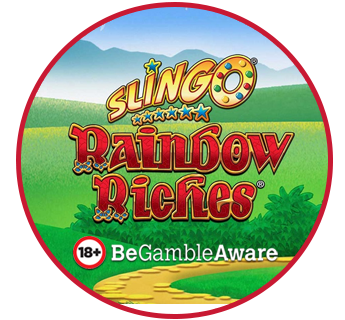 Creating slingos in Deal or No Deal Slingo also helps you increase the value of the prizes shown on the left hand side of the game! Whether you have watched the gameshow or not, playing Deal or No Deal Slingo couldn't be simpler. To start choose your favourite site with Deal or No Deal Slingo and select the amount you wish to bet from the plus/minus buttons using the stake tab, then choose your lucky red box from the 26 on the screen. Your selected box will then be hidden away for good keeping, while the other 25 boxes stay on the 5x5 grid - Press Start Game to play your 10 SPINS. A little like bingo, when you play your initial 10 spins, 5 numbers/symbols will display below your grid. If any of the numbered boxes on the screen match the called number, the box will open, reveal its prize value and then be removed from the game. 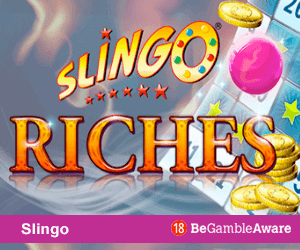 If Five boxes open next to each other either vertically, horizontally or diagonally it'll create a Slingo, with every successful Slingo you'll move you a place on the prize multiplier bar to the left of the screen. After your initial 10 spins, you can carry on playing Deal or No Deal Slingp if you land any Free Spins or you purchase extra spins, the unique of extra spins is displayed on the spin button for each individual spin. 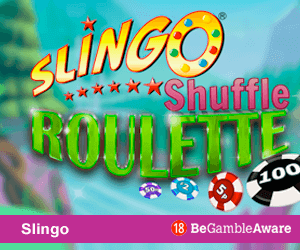 There are many slots and bingo sites where you can play Deal or No Deal Slingo our favourites include Spin Genie and Slingo.com but there are many others some of which we have listed above. If you are a fan of the Deal or No Deal Games, take a look at Deal or No Deal Bingo, which is similar to the Slingo version where red boxes open with every number called, and the opportunity to Beat the banker if you win the full house! Deal or No Deal Slingo has a theoretical RTP of 95.00% which means for every £100 wagered it will pay out £95.00.